You write your prayer letters and print them out for mailing. Then you reformat them to send to your email list. You also have to update your website with the new information. Are you then going to upload that information to your Facebook page? If you are using a website which has an RSS feed it can be done automatically. Not just your prayer letter, but any updates you put on your ministry website can automatically be pushed to Facebook. If your website is on a platform such as WordPress or Blogger it already has an RSS feed built in. Most website platforms have automatic RSS feed creation. On WordPress look for the RSS icon or a link to the RSS feed. It will be different based on your theme. On Blogger/Blogspot look for a link at the bottom of your page that says Posts (Atom). Those links will be your RSS feed address. RSS stands for Really Simple Syndication. It is a way that allows software to pull information from one site to another. Most importantly the RSS feed lets the software or other website see what is new. For our purposes you can set up Facebook to read the RSS feed of your main website and post the information for your friends to see. To do this you need to go to your Notes tab in your profile by clicking on the Profile link (currently between the Home and Account links on the top right of the page). After clicking the Profile link, find the tab at the top of the page that says Notes. You may have to click the ‘+’ sign to find the Notes tab. Click on the Notes tab. Once it is open you can see a link that says Edit import settings. Click that link to go to the page where you can enter your RSS feed address. In the box where it says Web URL you can type in a direct link to your RSS feed, or you can type in just the address to your website. 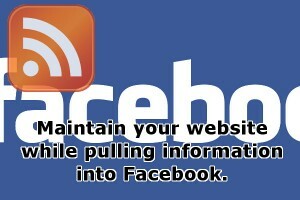 Typing in the address to the website will only work if your site generates an RSS feed that Facebook is able to locate. You are limited to just one feed address using the native RSS import tool. Later I will write about how I get around the limitation using other online tools. Another way to get a feed into Facebook is through third party applications. The one I have used is called Social RSS. It allows you to import more than one feed. The basic options are free. However they offer statistics on who clicks on your links and other features for a price. For what we are wanting to do the free package is sufficient. Do a search for the Social RSS application within Facebook and install it. Once it is enabled you will be presented with a page that allows you to import up to 5 feeds for free. Each one of the feed import tools has advantages. They also each have problems. The reason I found Social RSS was that there have been times when the native Facebook import tool would not work for several weeks at a time. It seems to be more consistently working now, but by using both services I have found things I like about both. The problem with this is that all of my website updates are posted twice to my Facebook page. I don’t think that is much of a problem since some of my friends may see the first posting and other friends catch the second one. The native application pulls the story from your website into Facebook as a Note. The advantage to this is that your friends get to see and read the whole posting within Facebook. They can also post comments at the bottom of each Note. The problem is that the RSS import does not create a link out to your website. Your friends don’t know where the Note was pulled from to get more information if they wanted it. The point of your Facebook page should be to drive people back to where they can get exactly the information you want them to have in a controlled environment—your website. You are also limited to just one feed address using the Facebook import tool. Social RSS has the advantage that the links it creates go directly to your site. That is obviously what you want. The downside is that there is no way for them to read the whole post in Facebook. There is also not an easy way for them to comment. They can leave a comment under the link that goes to your site. But by the time they go out to your site and back to Facebook they will forget to go back to the link and leave a comment. Ideally your content would be easily read by your friends and provide a link to your site. I have not found the solution in one tool yet. Therefore I keep importing my information using both tools. The question is, “will you be able to use this tool?” The best way to find out is to go to the front page of your website and look for the orange RSS logo (this can be different colors, but the standard is orange). It may be on the site itself or in the address bar in your browser. You can also search for the words RSS, Feed or Atom on your front page. If any of these are present then you have an RSS feed automatically being created for your site. You can click on the RSS logo or one of the links to your feed and copy the address from the address bar in your browser into the Facebook tool that you choose. Do you know of another Facebook tool that will allow us to pull in multiple feeds? What about a tool that takes care of the issues of not having a link to the original post or not pulling in the full content? Please post any information or questions in the comments. Since writing this I have found another tool that I like better than both the native RSS import tool and the Social RSS tool. It is called NetworkedBlogs. You can read about it and see if it meets your needs better.